From the cutting-edge of technology comes this book on Building Information Modeling (BIM), the newest technology in the AEC industry that allows the professional to create 3D models of a building that includes much more data than a traditional 2D CAD file. 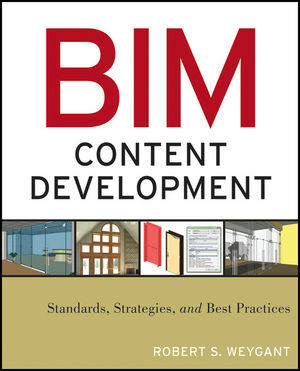 Developing BIM Content explains the type of information that can go into a BIM model from a vendor-neutral perspective and explores different methods for organizing content. For anyone interested in creating feature-rich BIM object and models that work on any platform, this is a must-have reference. Robert S. Weygant, CSI, CDT, SCIP, chairs the Construction Specifications Institute's (CSI's) BIM Practice Group, sits on its Technical Committee, and is the President of the New Hampshire chapter. Weygant has worked as a general contractor, manufacturer's representative and specifier, and currently is an independent BIM consultant/developer. Chapter 1. The Mental Transition to Building Information Modeling. Chapter 3. Understanding Parameters, Attributes and Constraints. Chapter 4. Standards and Formats. Chapter 5. Where to Begin. Part II BIM Content Basics. Chapter 6. Basic Modeling Considerations. Chapter 7. Creation and Management of Materials. Chapter 8. CAD Imports and Nonparametric Objects. Chapter 9. BIM Data: The “I” in BIM. Chapter 12. BIM Data and Specifications. Part III BIM Content Types. Chapter 15. Floors and Ceilings. Chapter 16. Windows and Skylights. Chapter 18. Stairs and Railings. Chapter 19. Curtain Walls and Storefronts. Chapter 20. Fixtures and Fittings. Chapter 22. Mechanical, Electrical, and Plumbing Components. Chapter 23. Site and Landscape Components. Chapter 24. Detailing and Annotations. Appendix A. Omniclass Table 49 – Properties.